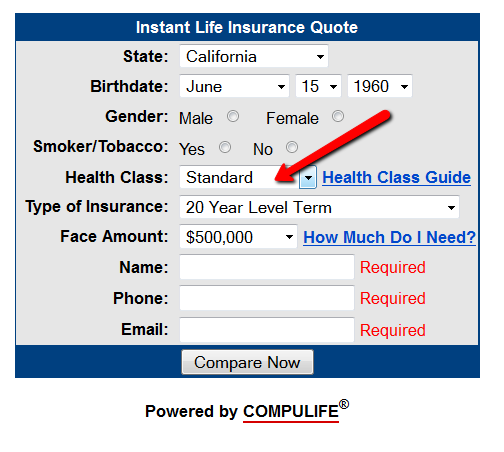 A “Medium Substandard” life insurance classification is generally applied to an applicant who is healthy enough to be approved for life insurance, but due to a moderately risky health condition, will be asked to pay a higher premium than healthier applicants. When you complete our quote form, quotes will be displayed for the “Standard” rating immediately. You can expect your premium to be approximately 100% higher than the “Standard” premium quoted. To calculate this, just multiply the premium by 2. Will it Be Exactly 100% More? Please note substandard ratings are officially labeled as “table ratings” by life insurance carriers. So if you get approved in a medium substandard rating range, the insurance company might actually call it Table 4 or Table D.
Most companies charge 25% per table below the standard rating. It’s possible you could get a Table 4 or Table 5 (D or E) rating, which would only cost 100%-125% more than the standard rating, but the most common of the two is Table 4, which is why we show a 100% addition.